Apple bruised pigs and fromage baguettes, as the source of the phrase ‘cheesy’ music, were just a couple of the tales we were told at yesterday’s cheese tasting at the Grain Barge. For an event that promoted itself as cheese and alcohol based we got to hear a lot. This latest event was the third big ‘do’ recently hosted by the Bristol Beer Factory. The previous two were the opening of the visitors’ centre, and the chocolate and ale tasting. The stormy and cold evening of the choc tasting was happily offset by the beautiful weather last night. The Grain Barge has a brilliant view of the Floating Harbour and the setting sun can be a highlight, although we didn’t linger upstairs for long. The vast quantities of cheese were all set up in the downstairs function room. Three glasses were set up for each taster, along with a jug of water and a spittoon for those who chose to use it. The cheese was passed around on a platter and we all took three pieces to try along with each of the drinks on offer – there were three tasting rounds of cheese paired with cider, wine and beer, respectively. The preferences were numbered from one to three although we were told that only the first choice would be counted. I guess no one told the Andrews and Alex that you should avoid politics at the table for jokes flowed for most of the evening about the state of the election and the new government. The hosts were social and jubilant, the company friendly, and the cheese, supplied by Trethowan’s Dairy, delicious in all its manifestations. 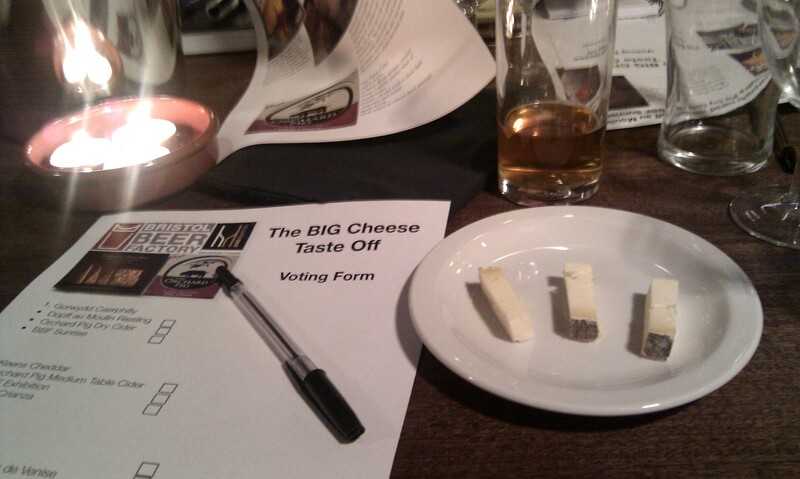 The first was the Caerphilly, then the cheddar and the blue Stichelton to finish up. 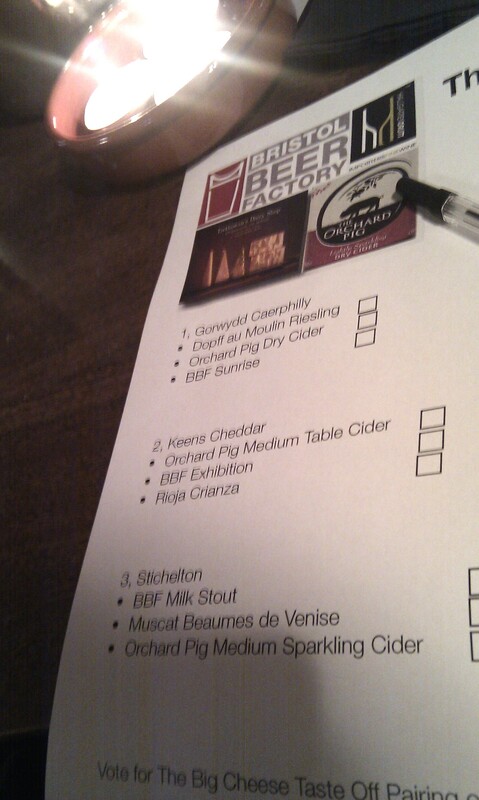 The overall ‘official’ winner was the cider but my preference leaned towards the Bristol Beer Factory beers. The cider was top choice for the Caerphilly (I found the wine too acidic), the Rioja was lovely but the Exhibition blended better with the cheddar, and while the Muscat Beaumes de Venise was my favourite drink of the evening, the sweet Milk Stout was my favourite choice to accompany the blue cheese. I won’t list all the drinks served over the evening because I didn’t keep a record of them. Bristol Culture’s beautifully scripted notes, and past promptness in writing up events, meant that I took a more passive approach in my reflections. I suggest a visit for more details (and a great review). Also keep an eye out for the post by Bristol Bites who was at our table and equally diligent with the note taking. The highlights of the evening were the cheese, the drinks, the company and the social atmosphere. All the talking did take a little while to get used to and while I initially felt rude at eating while being spoken to, I soon managed to pick up speed and tasted along with the presentations. It may take a little work but I shall be more prepared for the next one. The origin of the word cheesy is not from the French cheese baguettes, by the way, its origin is the Indian word chiz which means ‘the thing’. No Indian drinks that night and it was a shame that the Indian Pale Ale from the chocolate and ale tasting didn’t make an appearance but I’ll keep going back in case it does. This entry was posted in Bristol, Food and tagged Bristol, Bristol Beer Factory, caerphilly, cheddar, Grain Barge, Hallgarten, Orchard Pig, Trethowan's Dairy. Bookmark the permalink.